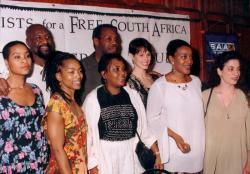 Press conference in South Africa by members of Artists for a Free South Africa's Democracy Tour shortly after landing in Johannesburg. 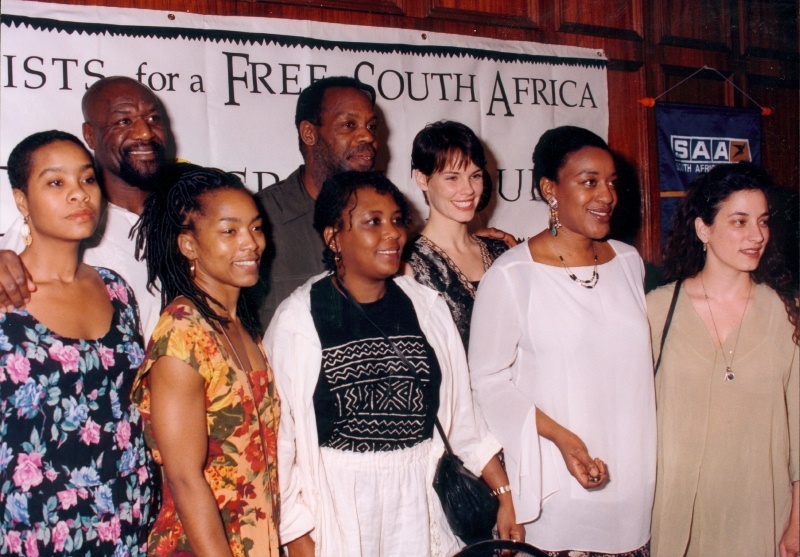 The Democracy Tour, Artists for a Free South Africa's first delegation to South Africa, was focused on voter education for first non-racial election. The Democracy Tour was organized in partnership with Kagiso Trust and various local and national voter education groups including Matla Trust, Community Law Centre and others. Back row: Nashormeh Lindo, Delroy Lindo, Danny Glover, Alexandra Paul. Front Row: Angela Bassett, Asake Bowmani, CCH Pounder, Sharon Gelman. Used by permission of Artists for a New South Africa (successor to Artists for a Free South Africa).